A compilation of evidence to encourage further scientific research and analysis of the issues by specialists to prove or disprove the O'Brien thesis of the recent existence of a large Mid-Atlantic Ridge island centred on the Azores. The some of the visuals on this page require the Adobe Shockwave Plugin avaible from http://get.adobe.com/shockwave/ This appears to work on most browsers, as long as you have ActiveX controls enabled. On IE browsers, this is under the Tools->ActiveX Filtering option. So tick-box the box there and it should then work. He produced the survey of the Island in 1985, utilizing Portuguese Admiralty Charts, now superseded by the Institute of Oceanographic Sciences map shown below, and further recent detailed hydrographic input, 20% of which has been utilized within the 3D Visualisation. Further information is sought to allow for the siting and collection of new sediment cores in un-disturbed areas. The identification by O'Brien of the substantial ancient dry or hanging river bed on the cliff face by a new road on the south coast of San Miguel is a straight forward geological analysis of the observed evidence by an experienced geologist. He followed up this discovery by searching for and finding the former river systems of a large island using Portuguese Admiralty undersea charts'. He states: The whole of the Azorean island group was separated and surrounded by a net of submarine valleys that had all the hall-marks of having once been river valley's on the surface. The Azores could - and probably had, within comparatively recent times - sunk by many thousands of feet. The technology needed to prove or disprove the Atlantis issue is now available. Science has reached the point of being able to understand both the creation of' such large structures and the subsequent catastrophic movements in the earths crust, which have destroyed them. Finding and dating the remains of fresh water life at depths of up to 4000 metres, finding coral, sandy beaches and volcanic material below sea level and identifying former river valleys is within reach and we look forward to providing further news on this subject later in the year. So far this century there has been a confirmed report of a one mile rise in the floor of the ocean 576 miles north of Azores when a trans-atlantic cable broke. Dr David F. Zhirov in 1970 reported sand beaches and coral at a depths of 2 miles south of the Azores. Confirmed evidence exists that sections of the Mid-Atlantic ridge have been above sea level in the past and fresh water diatoms have been found 2 miles down in the Azores area dated 10,000 to 12,000 BC. Volcanic material described as un-dissolved tachylite was found on Telegraph Bank 500 miles north of Azores, indicating that it had been laid down above sea level at some time between 50,000 BC and 10,000 BC. Sediment core analysis at locations off the coast of Africa have proved a 2 mile sinkage of volcanic island structures similar to those of the Azores. The more detailed evidence provided by the latest underwater surveys will assist in identify the former glacial sea level, and locating the river canyons of' a large island where rivers joined the sea before sea levels rose, thus matching the river canyon features of the American, European and African continental shelves. Open minds are required to concentrate current resources on the many disciplines required to re-create or resolve this mystery which has immense importance to our understanding of human origins and human diffusion. In particular, migrations from Africa to the America's from 60,000 BC. Important knowledge has been gathered at other sites on flood basalt formations, collapsed volcanic cones, plate tectonics, deep crustal rifting together with the rebound by up to 1km of the thick and old earths crust freed from the weight of glacial ice and the compensatory sinkage of perhaps up to 4km In the fragile young and thin oceananic crustal areas adjacent to major active fault zones. 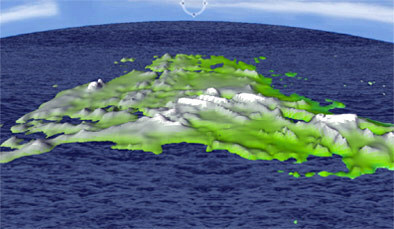 The Institute of Oceanographic Sciences map, contoured in metres, shows the islands of the Azores as the volcanic peaks of the worlds greatest Mountain range. The area is bounded on the west by the Mid-Atlantic Ridge rift valley fault, to the north by the Kurchatov Fracture Zone, on the east by deep ocean, and on the whole southern flank by the massive and deep East Azores Fracture Zone. Here we can see the three major tectonic plates which converge in this fragile crustal area, making it perhaps the most unstable structure on the planet. There is no doubt that world sea levels have risen on average some 400 feet since the maximum influence of the Ice Age, although the identification of shore lines at this date around 16,500 BC must be considered in the light of much greater compensatory movements in the earths crust and other factors. Certainly a large island at this latitude would have been a suitable glacial refuge for plants, animals and man, during a highly inhospitable, cold and extremely dry climatic phase with so much of the earths moisture locked tip within Ice sheets. Sea level rises may have been relatively stable in the area of Atlantis until two accelerated sea rises, due to massive melt water discharges, from land/ice locked lakes around 12,000 BC (50-40cm per annum) and 9,300 BC (30-20 mm per annum). A third and final accelerated rise took occured between 6,000 and 5,500 BC as result of further melt water discharges. The process of' sea level rise took place as the earth warmed to the highest levels recorded for over 120,000 years, peaking before 2350 BC by some 3°C higher than current levels. The observational evidence of the geological structure of the Azores Islands, above and below current sea level, does provide evidence of river systems, which must have been created by a much larger land area. However not enough convincing evidence exists because of substantial past volcanic activity, subsidence and land slippage within the area. This creates problems in searching both for ancient remains or biological evidence that may still exist. Catastrophic flooding, collapse and sinking at around 9,500 BC has been suggested by many historical sources and it has now become a simple matter for science to prove or disprove the thesis. Confirmation and dating of a very large sunken island requires access to and analysis of just a few sediment cores and a search for underwater structures in key locations. These may exist from just below the surface of the sea down to a depth of 11,000 feet. 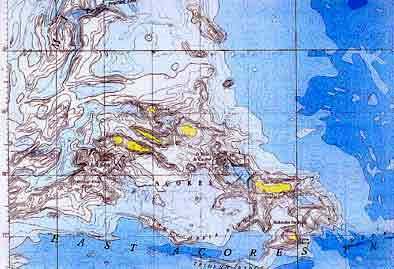 It is important to realise that the O'Brien survey and the small adjustment for tilt re-creates the island as clearly described by Plato and many other independent and unconnected sources. The major building structures, if they still exist, will lie to the south west of the great plain in an area covered by the greatest depth of.' water close to the catastrophic crustal rifting of the East Azores Fault Zone, which can be clearly seen on the Institute of Oceanographic Sciences map. We have featured more than 30 important books on our recommended reading list, which in total have produced a weight of evidence to support the basic thesis presented by O'Brien, spanning from the common records of the earliest antiquity to serious modern research. Only now are we beginning to appreciate the stature and reliability of the records presented by Solon and Plato, and accept recent Scientific explanations for related dramatic crustal rifting movements and vertical movements of the earths crust. On a world wide scale there is common story of a great flood preceded by exceptional rainfall and accompanied by earth quakes and volcanic eruptions. It may be of significance to state that tsunami tidal waves were not directly mentioned in connection with this great flood story and that modern science has identified and dated three distinct rapid rises and three small declines in sea level since the ice age as the worlds climate warmed. The first great flood may have held more significance to early man and Atlantis, than the many subsequent floods and other natural disasters. The latter include interruptions to the circulatory flow of the Gulf Stream through fresh water input/ice melt, and episodic cometary debris impacts. We welcome further input into this project from all interested parties. 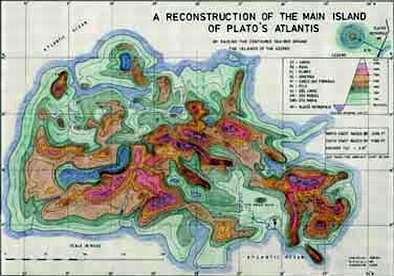 The more detailed hydrographic information, which we hope to obtain from the Portuguese authorities and the Southampton University Oceanographic Department, will allow a few small steps to be made to either dismiss the existence of Atlantis at this site or confirm the detailed evidence to re-create the great legend as fact. (by raising the Contoured Sea Bed around the Islands of the Azores).